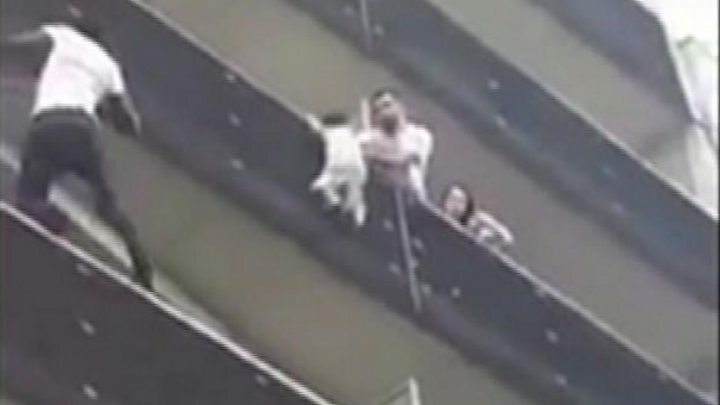 A Malian migrant has been hailed a hero after he scaled the front of a building in Paris to save a small boy hanging from a fourth-floor balcony. In less than a minute he pulled himself from balcony to balcony and grabbed the four-year-old as a neighbour tried to hold the child from an adjoining flat. The drama was captured in a video posted on Facebook. It unfolded on Saturday evening on a street in the north of the city. Paris Mayor Anne Hidalgo praised the 22-year-old’s heroism and said she had called him to thank him. She referred to him as the “Spiderman of the 18th”, referring to the Paris district where the rescue took place.